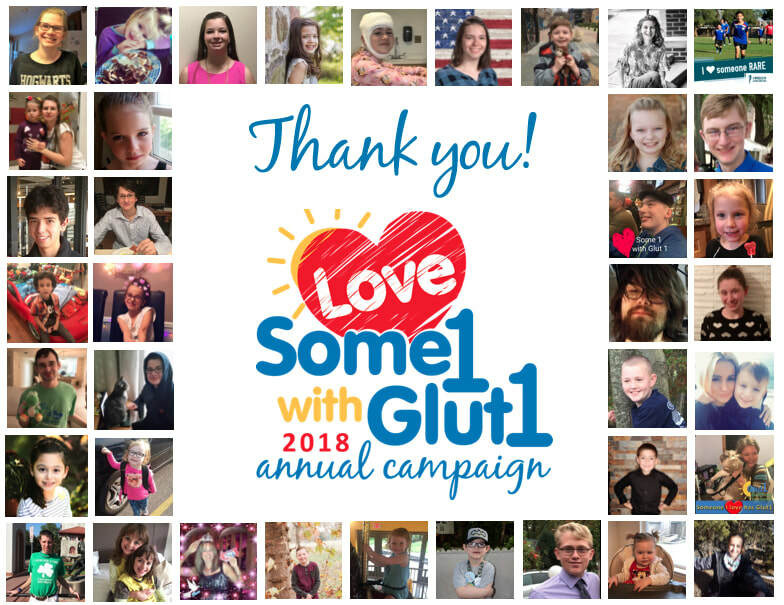 As our ♥️Some1 with Glut1 campaign is winding down, we would like to thank everyone who helped raise awareness and funds by sharing their stories. Several families did different types of events during this time, and others took the opportunity to make a tribute donation in honor of their loved one. We are grateful for everyone who helped. The work of the Glut1 Deficiency Foundation (awareness, education, advocacy, research) is funded entirely by the efforts of Glut1 Deficiency families, and it could not exist without your help. We appreciate all who join us in trying to help make life better for all in the community. The campaign will remain open a few more days as donations make their way and are accounted for...so there is still time to contribute, and please make sure to watch the campaign video below for a reminder of how funds are put to work. As part of our Glut1 Deficiency family, we hope that you have found help, hope, and encouragement through the Glut1 Deficiency Foundation and its mission. We find inspiration and motivation each day in the courage and kindness of the patients and families in our community, and we work hard to bring help and hope to every person in it. We brought families and professionals together from 26 states and 11 countries to meet, share, and learn at our 7th biennial conference in Nashville. We raised awareness and spread education in the medical community through our Find Some1 with Glut1 program, giving talks and hosting exhibit booths at 6 professional national and international conferences. We funded $80,000 in research grants, bringing our total to $500,000 in awards for bold and innovate ideas to help bring better understanding, better treatments, and ultimately a cure. We expanded our online and print resources, including a revamped website and a new brochure to help in educating others and raising awareness. We mailed over 50 welcome packets with information and resources to newly diagnosed families in the United States and around the world. We took part in advocacy activities to give the Glut1 Deficiency patients, families, and the community a voice in the rare disease world. Please share your heart and take part in this year's Love Some1 with Glut1 online campaign, beginning Valentine's Day (February 14th) and running through Rare Disease Day (February 28th). Participating is easy, and the impact is enormous. All donations help fund our mission programs for increased awareness, improved education, advocacy for patients and families, and support and funding for research. Sign up to be a fundraiser on our new Flipcause platform. 1 Visit our Flipcause Love Some1 with Glut1 campaign page. 2 Click the button to "Become A Fundraiser". 3 Enter your name and email address, upload a profile picture, and click the button to "Sign Up". 4 You'll receive an email containing a link to your personal fundraising page with login information. You can further customize your individual page with a personalized story, more pictures, or a special message. See the "next steps" button in your email for ideas. The main page information also appears on each individual page. You can check the notification settings at the very bottom if you'd like to receive emails when donations are made to your page. 5 Share your page with the world starting on February 14th! Flipcause makes it easy to share with social media buttons or just copy and paste the direct link you'll receive in the email. Check donations you receive can be mailed to the G1DF with a note and your name and it will be added to your personal page. If you don't want to be a personal fundraiser this year, then we hope you will consider making a donation to the campaign to help us continue our mission to bring help and hope to all in the G1D community. You can make a donation on the campaign page, too - thank you! Our community appreciates you - see how much below!